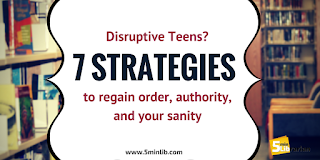 One topic that I wish was taught in grad school was how to handle disruptive teens. I didn't encounter many situations at my previous library, but when it did happen, I sometimes was at a loss for how to handle it correctly. If your library is within walking distance of a school, you might find more instances of disruption. 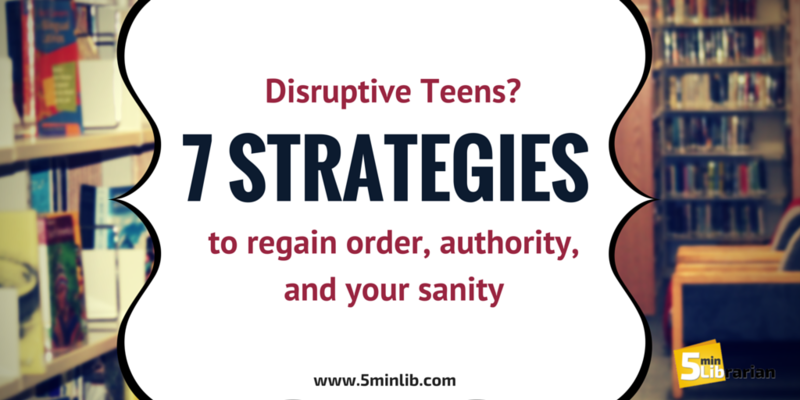 These disruptions could vary from a loud group at the computers to a teen overtaking a program. To find answers to these questions, we had invited Pete Smith, Whole Children Lead Teacher/School Librarian, to our YA Collaborative Group meeting. He had discussed six common dilemmas and provided great suggestions on how to de-escalate any situation. Pull out a chair and sit down. Talk slowly and calmly. They will find it unnerving and stop what they are doing. Once they disengage, you can talk to them about their behavior and how it affects the space and people around them. Don’t focus on who did what – you can’t change what did happen, so let’s focus on this point forward. Have them sit and seriously think about it. Have them come up with reasons for why they shouldn’t be doing it. Many of them may need the time to really think things through to understand the importance of the rules. Then talk with the teens. Suspect It Is a Special Needs Issue? Tell them what behavior you’ve been noticing and ask how you can help. They’ll most likely know what you are talking about and can tell you what they need help with. Focus on the behavior, not on a label! Identify person first, the disability they are diagnosed with second. Never make assumptions. They will know how to best help them. Using a code word like banana and working it into a sentence. If that doesn’t work, ask them for their parents’ contact info. Make sure to also find out what is the best way to reach them and the best times to call. Every meeting, review the rules. Give them an opportunity to step out to cool down, take a walk, and come back later. Find ways to connect them to their motivation. Sometimes, the library is not the place where teens need to be. If they are unable to follow the rules, you can send them home for the day and invite them back the next day. Fair means everyone gets what they NEED, not that everyone gets the SAME thing. Use a gentle, soft voice. Allow the person to tell you what is bothering them. Praise any movement in the right direction. Validate the person's possible emotions and what is upsetting to them. Be specific and gentle, but firmly directive about the behavior that you will accept. Explain your intent before making any moves ("I'm going to cross the room and open the door."). Take deep breaths, slowing down your breathing so that you can remain calm. Ask the person what would be helpful from you. Ask for permission to problem-solve the issue. The person may just be venting and may not want you to problem-solve with them. Summarize what the person has said, and summarize any agreed upon resolutions. Do not argue. When a person is already agitated or angry, he/she may escalate if they do not feel heard. It is more helpful to show that you heard them and to de-escalate than to be correct. Do not describe the person creating the disturbance, or assign them emotions ("You're frustrated because..."). Do not touch the person or make sudden moves. Do not threaten the person. Threatening could increase someone's fear, which could prompt defense or aggression. Do not take the person's behavior or remarks personally. Disruptive or aggressive behavior generally results from other life problems. Thank you, Pete Smith, for allowing me to share your great info! And thanks to Amanda Maclure for her awesome notes taken during this meeting. Thanks, great article! I shared with the rest of the staff at my library too! Just in time! Good luck! I really hope these tips help. Appreciate the share! There are so many things we aren't addressed completely in our grad school LIS coursework (or our own subsequent learning post-MLIS)so this really hits a sweet spot! You're welcome. To be fair about grad school, there is too much to learn, so hard to cover it all. However, I do wish we had some courses on working with people... If there are some out there that do offer these kinds of classes, I'd be really happy to hear it!!! * When dealing with a group and someone is misbehaving, try and identify which individual is causing the greatest disturbance (if possible) before addressing the indiscretion. Teens often react more favorably when they are not all getting punished for the actions of one person. * Explain why the rules exist when talking to patrons/teens. * When a patron (teen or otherwise) complies with a behavior request, say thank you. * When talking to a parent of a teen, do not judge the kid, just explain the behavior that occurred. * If someone brings up race/culture/religion- I emphasize that ejection or action is not something I want to do and it is better for me if more people are using the library, so I have no reason to invent some misbehavior, nor ignore others misbehavior.